In more recent versions of Office, encountering a corrupt file that can’t be repaired by the application is rare. But it never seems to fail that the file that will take hours, if not days, to recreate, becomes corrupt. This is exactly what happened to me a couple of weeks ago. I tried to open a template that took me over a week to develop only to discover it was corrupt and the application couldn’t repair it. After a few minutes of panic, I realized I could recover the majority of the file. Through the years, I have found file corruption typically occurs in the structure of the file, rather the content that’s visible when the file is opened in the application. And, thanks to the XML file format, there’s a good chance that content can be recovered. If you’re not familiar this file format, Office files that have an ‘x’ at the end of the file extension, such as .docx, .xlsx, .pptx, are stored as a structured set of text files in a compressed ZIP package. And just like any other ZIP package, you can open it and view the set of text files. All you need to do is add .zip as the file extension and open it in the File Explorer. The short version of the procedure to recover a corrupt file is to create a second file that is not corrupt. Add the .zip file extension to both the new and corrupt files, open the packages in the File Explorer, and then copy portions of the corrupt file to the new file. Place a copy of your corrupt file on your Desktop. Create a new file using the same application as the corrupt file. Close the Recover file and the application. Right-click the corrupt file and then click Rename. Add .zip to the end of the file name. For example, a file named Report.docx will be named Report.docx.zip. Press Enter to rename the file. Follow steps 6-9 to append the .zip file extension to your file named Recover. Double-click your corrupt file to view its contents in the File Explorer. For a Word file, drag the folder named Word to your Desktop. For an Excel file, drag the folder named XL to your Desktop. For a PowerPoint file, drag the folder named PPT to your Desktop. Double-click your file named Recover to view its contents in the File Explorer. Delete the Word, XL, or PPT folder. 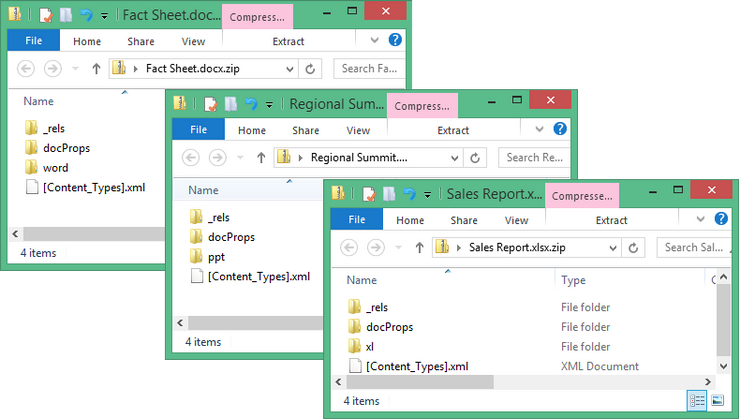 Drag the Word, XL, or PPT folder from your Desktop into the Recover file contents. Rename the Recover file and delete the .zip file extension. Confirm the file extension change. Click File, click Open, and then navigate to your Desktop. Click the arrow to the right of the Open button and then click Open and Repair. Confirm the file repair if prompted to do so. If your repair was successful, the file should open in the application. It may not be a full recovery of the corrupt file, but the main content should be intact. If the file does not open, you can try recovering a smaller portion of the file using the same steps with different files in the package. For example, if it’s a Word or PowerPoint file, open the Word or PPT folder of the compressed file and copy document.xml or presentation.xml. Or for an Excel workbook, open the XL\Worksheets folder and copy the individual sheet files, such as sheet1.xml.